CARLISLE: Carlisle United had dreamed of an FA Cup fairytale back at their Brunton Park home that had been so heavily damaged in December’s floods, but Everton ruined the fourth tier side’s big day with a comprehensive 3-0 win in the fourth round yesterday. It was an emotional occasion for Carlisle following the devastation wrought by Storm Desmond which had left much of the Cumbrian city deluged, including the football stadium, where water rose as high as the crossbars. 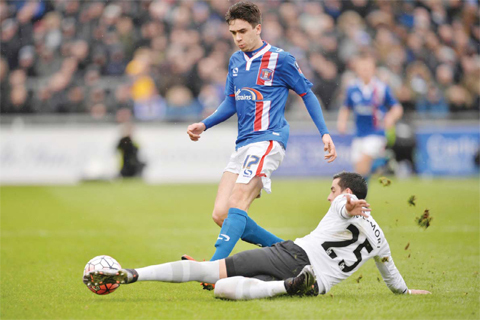 Following a major relief effort, with players, management and staff helping with the clean-up as the club were forced to play away from home, Carlisle had returned to League Two action at a newly-relaid Brunton Park last week. Still, everyone’s thoughts remained on their money-spinning, glamour Cup tie against five-time winners Everton, seeking their first final success in the old competition since 1995. Yet their hopes of achieving an upset befitting of the occasion in front of a sold-out crowd were doused within two minutes as Aaron Lennon swept down the right wing and crossed low for Arouna Kone to tap home the simplest of goals. When the rampant Lennon cut past a static defender to fire home a second after 14 minutes, a long afternoon looked in prospect for the home side but Carlisle held out until a brilliant 65th minute Ross Barkley strike from the edge of the penalty area made it 3-0.